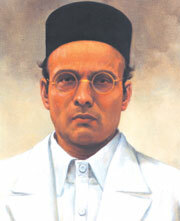 Veer Savarkar was a great revolutionary in the history of India’s struggle of independence. He was a great orator, scholar, prolific writer, historian, poet, philosopher and social worker. His actual name was Vinayak Damodar Savarkar. He was born on May 28, 1883, in the village of Bhagpur near Nasik. Ganesh , his elder brother was a strong source of influence in his life. At a very early age he lost his father Damodarpant Savarkar and mother Radhabai. Veer Savarkar established an organization by the name of ‘Mitra Mela’ which influenced the members to fight for “absolute political independence” of India. The Mitra Mela members served the victims of plague in Nasik. He later called the “Mitra Mela” as “Abhinav Bharat” and declared “India must be independent”. The British Government withdrew Veer Savarkar’s graduation degree for his involvement in the Indian freedom movement . In June 1906 he went to London to become Barrister. He wrote a book “The Indian War of Independence 1857″ on India’s struggle of independence, which was banned by Britishers. When he was in London, he encouraged the Indian students in England against the British colonial masters. He supported the use of arms in India’s struggle of independence. He was arrested in London on 13 March 1910 sent to India for trial. However when the ship carrying him reached Marseilles in France, Savarkar escaped but was arrested by the French Police. On 24 December 1910, he was sentenced to jail in the Andamans. With his efforts a library was established in the jail. He even tried to impart education to the illiterate convicts in the jail. By the demand of great leaders like Vithalbhai Patel, Tilak and Gandhi a Savarkar was released and brought back to India on May 2, 1921. Veer Savarkar was shifted to Ratnagiri jail, and then to the Yeravada jail. The book ‘Hindutva’ was written in the Ratnagiri jail. He was released from jail on January 6, 1924 and he later founded the Ratnagiri Hindu Sabha to preserve ancient Indian culture and worked in the direction of social welfare. Later he joined Swaraj Party, formed by Tilak and founded the Hindu Mahasabha, a separate political party and was elected its President. The party opposed the formation of Pakistan. The assassin of Gandhiji – Nathuram Godse was a member of the Hindu Mahasabha. Veer Savarkar was charged by the Government of India in the Mahatma Gandhi assassination case but was acquitted by the Supreme Court of India. At the age of 83 on February 26, 1966 he passed away.